I'm posting quite a bit today, but you can blame it on Dena for sending me all these great pictures. I've already punked Dale and myself, so now it's Sean's turn. Except for one thing. When I saw Sean's picture in the yearbook, I found myself thinking, "Wow! Now that's a cool picture." I decided to show you both his picture and the guy next to him, just for the contrast. The guy next to him -- who I legitimately don't remember -- looks like a high-school kid. Sean looks like a member of the Rat Pack, ready for a night on the town in Vegas with Sammy, Frank and Dino. His hair looks great and the look on his face tells us that he is way too cool for the room. Sean, thanks for your post today on the you-in-the-parking-lot photo. 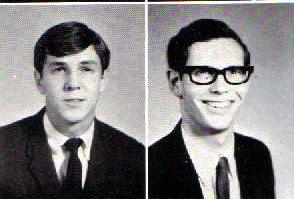 I'm still chuckling at your humorous caption of that picture, so I'm eager to see what you have to say about MIKE's comments on your senior photo!
" . . . and the look on his face tells us that he is way too cool for the room," I'll vote for that one. How did you know about Herr Bolt and the Peace Corps?? Great story about you and Steve playing poker under the guise of studying German. You said Steve's a hoot - I'm guessing you both are. Please send him my greetings. First, we need to get that scanner out of Dena's hands!! Truth be told... Like many of us, I was a mix of things. I was kinda shy for the most part. Also, I had spent so many years in Catholic school, where humility was pounded into you. But there was another side where I just loved mischief and occasionally thumbing my nose at authority. I think it's hard-wired into the Irish. As for cool...well, I never thought so. I was trying to find my place. Years in Catholic school shaped a lot of who I am, but it took me a long time to figure out. I can say that on the day of senior pictures, I wasn't too smart. I forgot to wear a sportscoat for the senior picture and at the last moment I spotted Mike Latimer walking down the halls and he let me borrow his jacket. So, if I look cool, the clothes make the man they say, and I would give a big nod to Mike "Loter" Latimer. As far as Rat Pack, I admit to hanging out with a Pack, of sorts: Mike Latimer, Mike Schmidle, Bill Everson, Steve Farmer, Gene Bacon, Mike Foley, Don Day, Bob Coulter, and Bob Fern. This was not a Choral group, nor were we members of the Mensa Club, to be sure. All good people, but also we loved a bit of mischief. Now, one person who I would tell you had a boatload of the "cool" factor, and I wonder what ever happened to him, was Walter "Chip" Goodrich. Chip drove an MGA, then later drove a Lotus Elan (how cool is that!! )He walked the halls in blue jeans and a black wool turtleneck. His hair was cut like Illya Kuriakian (from the Man from Uncle TV show) , he was an artist and drew all the flyers passed out for the Open Houses and Fire house dances), and girls just seemed to throw themselves at the guy. There was even a rumor that he and his art teacher were seeing each other after school. That made perfect sense to me. As far as guys who seemed really handsome at that time, I would put Rex Foley, Rocky Rochester, and Greg Cowart in that group. All three were terrific people as well. I was an office assistant my senior year, and I had that job when everyone else was in their home room. I was sent by Mrs. Hipler to pick up all those absentee cards that sat in envelopes outside the classrooms. Before school, guys and girls would ask me to "pull" their cards. So, when I gathered the absentee cards, I would pull several and put them into my locker, drop off all the cards to Mrs. Hipler, she would record them and give them back to me. I'd stop off at my locker, pick up the cards, and replace everything back in those envelopes hanging on the wall. I developed a lot of friendships that way. God, it was fun. I was not always a Saint. The nuns might have been a bit disappointed, but it did feel liberating at times. Now, ask me about fake report cards, and I'll tell you a great story!! I'd be surprised if anyone wore blue jeans with a turtleneck. Turtlenecks were OK, but we weren't allowed to wear jeans to school. I wonder if the girls remember the huge controversy -- around '64 or '65 -- about whether they should be allowed to wear culottes. I remember the culotte (or however that almost obsolete word is spelled) controversy. I remember because I spent my freshmen year in Montgomery, AL where we all wore these cutsie culottes with matching tops. When I got here, the fashions were different. However....our culottes in Montgomery had a skirt flap in front and back with the culottes showing as you walked so I got away with it..at least for my sophomore year...before the "Villager" craze started. The kids today would never believe that sometimes we dressed up in suits ON PURPOSE. Also, do any of you girls remember that we were allowed to wear pants when it snowed IF and ONLY IF we wore them under our skirts????? No way! I would rather have died and I pretty much nearly did from the cold. Mike--Regarding jeans, I think you're "misremembering". A lot of us wore white levis, cord levis and even blue superlim levis as early as sophomore year. John - I remember that, also. The school's big hangup seemed to be girls wearing pants and guys' collars. Remember you could not wear surfer shirts because they had no collar and I seem to remember that a guy's hair could not touch his collar. What rubbish! Although, I think the dress code (or lack of dress code) today is pretty terrible. Does not give kids an idea of what is going to be required for their attire in their career jobs. (maybe a record store or tattoo parlor might not care). I think that is Chris Kessler in the other picture. He was at the reunion and he looked fantastic! Talk about aging gracefully! Do you remember someone coming to school in what was called a "granny gown" - and this fashion was immediately added to the list of what was not allowed? As to shoes, was it all sandals which were not permitted or simply thong sandals? Oooooh, way too risque! Very few years after we graduated, all sorts of more relaxed garb became standard in high schools - long hair for guys, plus mini-skirts, bra-less, and see-through blouses. And jeans for all. Someone who worked at FDA a couple years ago shared that attire on the job was very laid back, and not just on Fridays. I may have been wrong about the jeans. What was very strange to me was that by around 1974 or '75 -- I had younger sisters and a brother -- kids were wearing halter tops and bathing suits, or so it seemed. The only dress code was that you couldn't violate the indecent exposure law. Remember, guys, our hair couldn't touch our collar or our ears. I think Kathy Rector, Kirk's sister, may have been the person who wore the granny dress. Such controversy! She and I were into the whole British invasion, especially fashion. Kathy was an outstanding seamstress and made wonderful Modish clothes. She would see a picture of a dress one day and by the next day she would have made it. I bet granny dresses in school would be a welcome relief now.